Designated an Epic Ride by IMBA, the Mid Mountain Trail hovers at an elevation of 8,000 feet throughout its entirety making it a fun, intermediate trail loaded with pristine single-track. 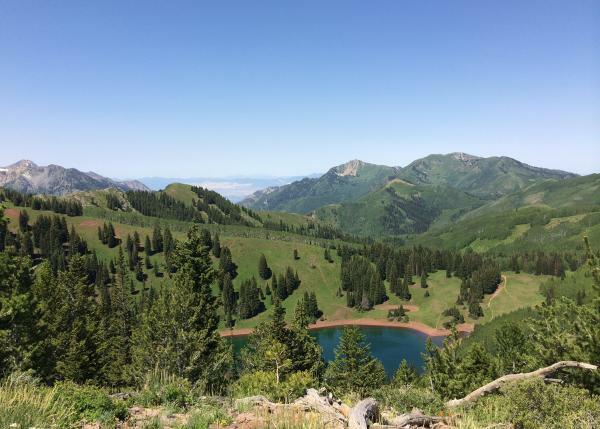 The trail stretches from Deer Valley Resort all the way to Park City’s Summit Park neighborhood, and many of the other area trails intersect with it along the way. The views are spectacular and varied as it meanders through aspen groves and pine trees, and the ride can be as long or short as desired. 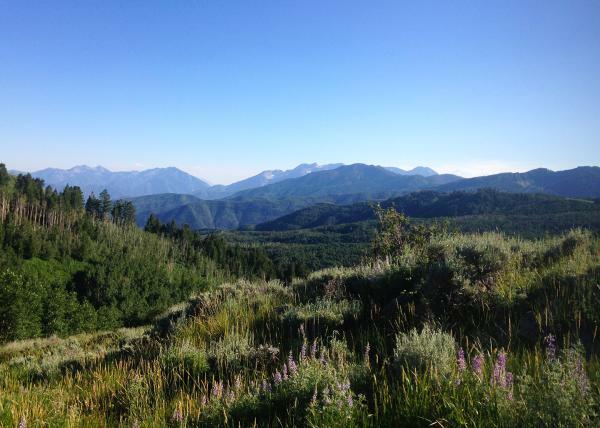 Mid Mountain Trail offers plenty of loop options or can be ridden as an out-and-back starting from Deer Valley Resort’s Silver Lake area. 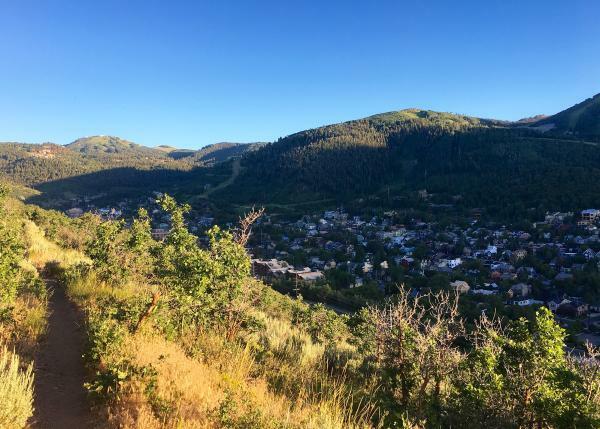 Here’s an option for riding Mid Mountain as a loop: start your ride at the base of Park City Mountain and climb up Armstrong, which is uphill-only (for bikers). Four miles in, Armstrong merges into Mid Mountain. Cruise across to Deer Valley Resort, continuing past the Silver Lake area, and descend via Deer Crest. It’s nice to get the climb out of the way before it’s time to cruise. The bottom of Deer Crest will drop you at the Snow Park area of Deer Valley Resort. From here you can cruise down the road back to your car in the Park City Mountain Resort parking lot. There are also plenty of lunch options to choose from on the ride back. Easy to access from many different points in Park City, Lost Prospector is an enjoyable cruise with fantastic views of the town and the resorts. Lost Prospector may be ridden as an out-and-back or a loop that includes a cruise along the Historic Union Pacific Rail Trail. A fun beginner-intermediate option, Lost Prospector is a great trail to ride before linking up to others in the area for a longer ride. It also serves as a great introduction to single-track mountain biking. To make it a clockwise 7.8-mile loop, park at White Pine Touring and hop on the Rail Trail. Head east down the Rail Trail, which is paved, and then turn onto Skid Row (which will be on the right). Skid Row features a few smooth switchbacks as the climb begins and then levels out further up. At the top of Skid Row, turn right onto Lost Prospector which runs along the hillside overlooking the town. Keep following Lost Prospector until you reach the intersection of the trail and Aerie Drive. Take Aerie Drive back down to the Rail Trail, which will lead you back to the White Pine Touring parking lot. Flagstaff Loop, accessed from Deer Valley Resort’s Silver Lake area, can be somewhat tricky to find but is oh-so-worth the beautiful views. Think open meadows and expansive views of Mt. Timpanogos. Starting from Silver Lake this route can be accessed via Mid Mountain Trail, and then up Team Big Bear and Road to Ruby. The loop includes a bit of fairly steep climbing and some more technical sections, making it an intermediate-advanced route. 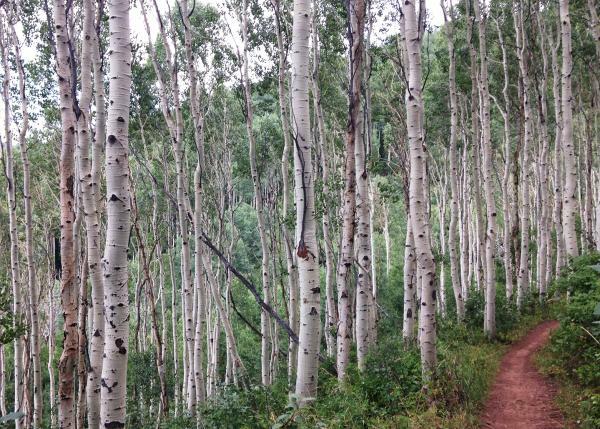 Deer Valley Resort has made significant improvements to its trail system within the last few years, meaning rather than doing a small loop before circling back to the same trails you rode up, the downhill options are plentiful. Try the recently built Tidal Wave. This flow trail features banked turns, fun rolls, gap jumps, and other features. While many riders choose to access Tidal Wave by chairlift, it’s always fun to earn your turns by climbing first. Flying Dog includes a steady climb followed by a smooth 5-mile descent (if ridden counter-clockwise) that is sure to delight. An intermediate trail in the Glenwild area of Park City, located just outside of Kimball Junction, Flying Dog can be accessed via the Spring Creek Trailhead or the Bad Apple Trailhead. It’s wonderfully fun, offering smooth single-track and a variety of dips, curves, and rolls – a trail that intermediates and experts are both certain to enjoy. There are great options for exploring Flying Dog, allowing riders to make it a 10-mile ride or up to as long as 23 miles. Details and directions can be found here. There is no doubt that bikes and beer go hand-in-hand. Check out our après-bike dining guide, which outlines some of the hot spots located near the trailheads of these classic Park City mountain bike trails.